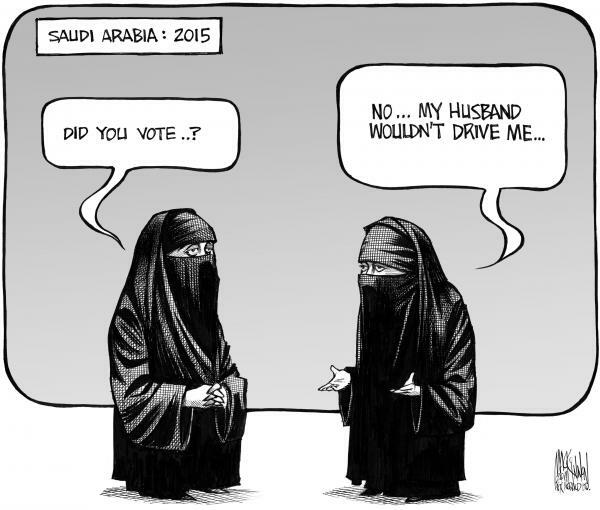 Home Odds Saudi Women permitted to Run for Political Office! Wait, but… oh. Elections and voting are relatively new concepts in the Kingdom of Saudi Arabia (the only country actually named after the family who owns rules it). Municipal elections did take place however in 2005 and again in 2011 after an eighteen-month postponement to allow for discussion on whether women should be able to vote (it was decided that they couldn’t). The former ruler, King Abdullah bin Abdulaziz Al Saud decided however that women would be given the opportunity to vote for the first time in the next elections, scheduled for this December, 2015. It is unclear exactly what responsibilities these municipal councils are tasked with or how much power they wield, though it is widely reported to be not much. Nonetheless all small victories count in this desert paradise, and Saudi women are indeed entitled not only to vote in the forthcoming municipal elections, but to also stand for office! It has been reported however by Arab News that there are 366 registered female candidates running in the upcoming elections, and that all of them have been ‘warned against addressing voters directly’. 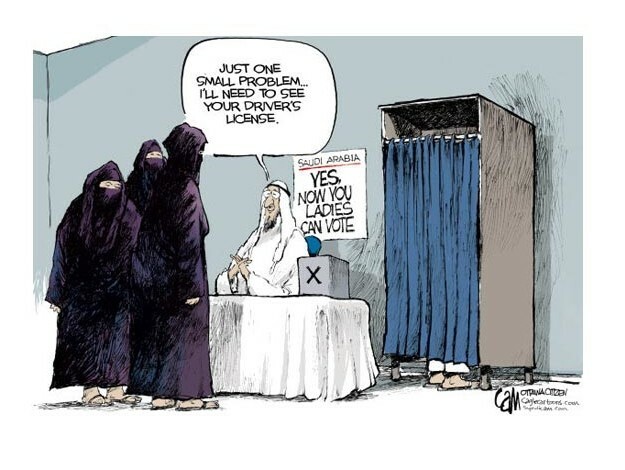 Yes folks, all citizens of Saudi Arabia will soon have their chance to vote for a woman, who of course is not allowed to be photographed, or seen, or actually speak to anyone. This is fine though, because female candidates are allowed to appoint agents, who are men who will speak for them, thus adhering to Sharia law. Failure to adhere to the gender segregation laws during the election process will result in a fine equivalent to about USD $2,600. 20 Comments on "Saudi Women permitted to Run for Political Office! Wait, but… oh." Good for them that they were given an euality of rights..Cheers! Good for the saudi woman that at least they’re given an equality of rights.. Cheers..
are you nuts , just plane stupit . Good for them But how do you know who’s who. With Trudeau or Mulclair it could be the same in Canada that you not see voters faces. I vote for the one in black with the brown eyes or maybe the blue eyes ? Anyway who gives a one. Harper is sending 15 billion in arms there. So much for keeping our noses out. Election for president of the “Obedient Wives Club”? Britain in 20 years with all these Muslims over here!